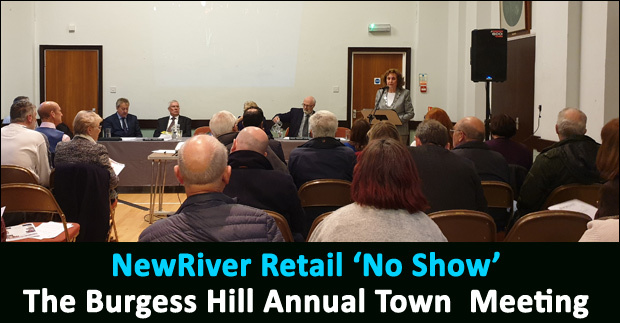 Burgess Hill resident Mike Mundy raised the biggest reaction at the annual town meeting on Tuesday evening when he questioned why NewRiver Retail hadn't shown up to address the public. 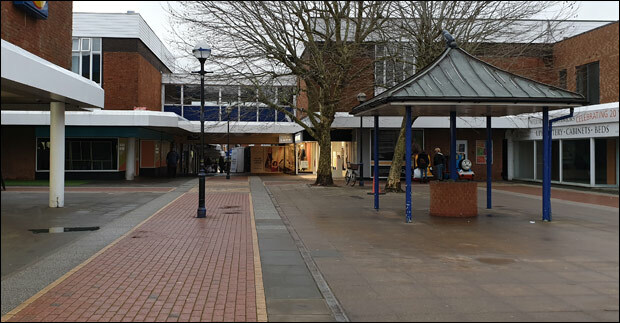 A BHU poll conducted last week saw 87% of respondents calling for the owners of the Martlets Shopping Centre to make an appearance after the Town Council had instead opted to invite 'Homes England', the Government organisation who are developing the Northern Arc - a group who have already made FOUR presentations to the public in the last 6 months. BHU made the public's wishes known to NewRiver and the council. Mr Mundy asked: "Was anyone from NewRiver Retail invited to give an update on the Burgess Hill Degeneration scheme?!" Mr Mundy's question was met by a large round of applause and laughter as 'Degeneration' is such a good term for what's happening to our town centre at the moment. Even Town Mayor Christine Cherry couldn't help by laugh. I guess even councillors can only remain positive for so long. In response, the council said: "NewRiver Retail are not prepared to come to any public meetings, they don't even come to address the council." The council said that Lidl opening on Leylands Road holds the key to any major demolition taking place at the centre, but did not give any timescale on when the demolition may actually start. It's a case of 'how long's a piece of string?' good readers. Cllr Pru Moore then spoke about the number of national chains struggling at the moment, tempering expectations that the town is to see a number of new retailers. 'The High Stret and shopping cenres have been in crisis for 4 years' she said, but remained positive about NewRiver Retail's pledge to continue with their scheme in Burgess Hill. "I do get your frustration Mr Mundy and I do like your quip, I appreciate that." said Cllr Moore. The council leader went on to say that if NewRiver were to pull out then we'd end up with lots of flats instead. Well what's to say that NewRiver themselves won't add more flats to the 140 they already have permission for if they can't get enough retailers to sign on the dotted line? What are your thoughts on NewRiver Retail chosing to avoid to the annual town meeting? Are the lack of updates starting to worry you?